The defense towers that dot the Pitiusan coast were part of a public works program begun in the18th century, during the reign of Charles III. They were built in an attempt to detect the approach of Saracen pirate ships, which regularly raided coastal villages and settlements, stealing salt, fish and harvested foodstuffs. To warn islanders as soon as a pirate ship was sighted, the watchmen manning the towers would send smoke signals or, alternately, light fires if the sighting had occurred in the dark of night. When the country folk saw these warnings, they quickly gathered their most precious belongings and either hid in the forest or took refuge in a fortified church. Built completely of stone, the towers have a circular, conical structure and are two storeys high. One of their architectural peculiarities resides in the fact that, to ensure greater safety, the doorway is located on the second floor so that entry is possible only by means of ropes or a ladder. This feature made it more difficult for pirates to break in. 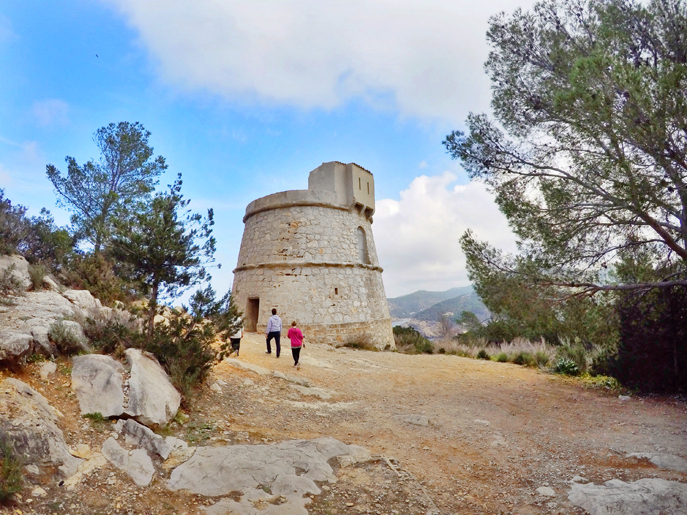 In the following post, we will review the three towers that guarded Ibiza’s northern coast, which also happen to be those closest to our agro-tourism. We hope that during your holiday you will have the opportunity to experience this aspect of our living history, right on the frontline of sea and nature. 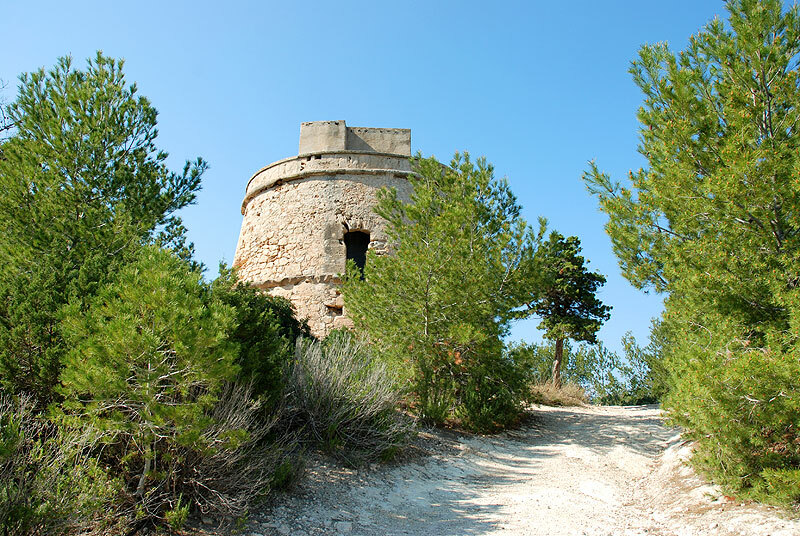 Also known as the Tower of Balansat Port or the Tower of Sant Miquel, this watchtower is located near the entrance to the Port of Sant Miquel. 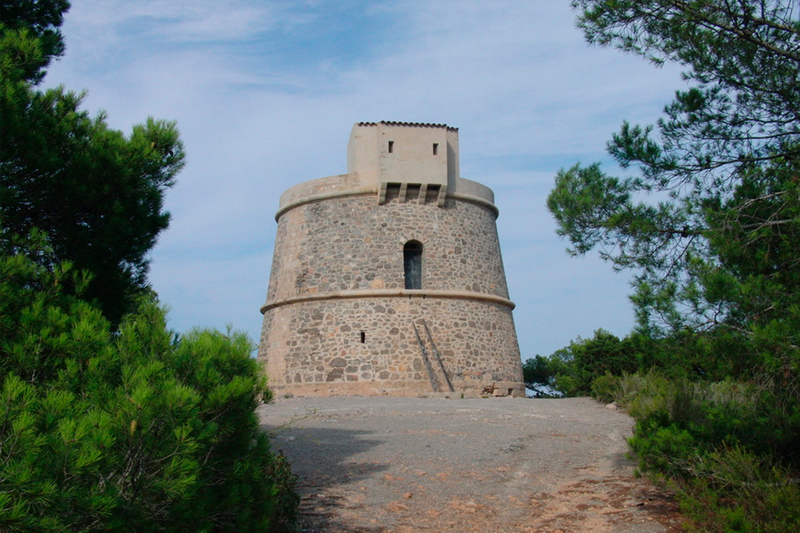 It is perched on a highpoint called Punta de Sa Creu and is part of the Sant Miquel parish. Situated on a cliff top, it stands an impressive 95 meters above sea level, making it one of the highest towers on the island. The views over s’Illa Murada and s’Illa des Bosc are breathtaking. This tower was completed on the same day as some of its sister towers, 26th October, 1763. También conocida como Torre del Cap de Campanitx, la encontramos en Santa Eulària des Riu, en territorio de la parroquia de Sant Carles de Peralta entre las playas de Canal d’en Martí y Cala Boix. Toda esta zona, que abarca la pequeña península de es Cap Roig, ha sido declarada Área Natural de Especial Interés (ANEI). Esta torre estaba dotada de 2 cañones hasta que el 29 de noviembre de 1846 sufrió la explosión del polvorín que en ella se guardaba, esta explosión la dejó casi totalmente destruida hasta que en el año 1982 fue rehabilitada gracias a ayudas públicas. La torre d’en Valls se encuentra a 67 metros sobre el mar y nos brinda unas vistas espectaculares de la isla de Tagomago.